One of the remarkable things about the book is how readily ‘book’ now describes something without paper and ink. We had books before the invention of printing, so it shouldn’t really be a surprise that we now have digital books. There is lots to say about the differences between print and digital books: about the way the form of one has been incorporated into the other, for instance; or the way digital properties make us look again at print. But what interests me is what they have in common. When we’re no longer talking about paper and ink, what is a book? For me, this is about wholes. The book describes something bounded, something complete, and this has a peculiar appeal in a digital world where everything is connected. The book establishes wholeness in two different ways. Firstly, the page sets out edges, marking off where the text stops and the rest of the world begins. More importantly, the sequence of pages, one after the other, establishes temporal boundaries – a start and an end – as well as a sense of direction. It is this sequence of pages that makes a book a book. You just have to look at how wary ebooks have been to leave behind the linearity of the codex and embrace multi-dimensional hypertextuality. Although in practice not all books are read cover-to-cover, what we tend to think of as a book starts on page one and ends when there is no more to read. This, I think, is important, as it means that the form of the book, whether paper and ink or bits and bytes, is well-suited to structuring narrative. Narrative, the telling of stories, is fundamental to the way in which we understand ourselves and the world we live in. I don’t mean that we make the world up, but that narratives are how we put things in order, establish chains of cause and effect, and, crucially know where to start and to end. Narratives break the chaos of the world into chunks that have some sort of integrity and can be retold again and again. The book incarnates narrative. It gives it a body. Not only does it make clear beginnings and endings, you also always know much there is to go. And, because you turn the pages, you are the engine that drives the story on. Good books – in print or digital – move us. But we, crucially, also move through them. It is hard to overstate the importance of the printing press. For about 500 years, printed material has shaped both the way we communicate, whether mediating between those living alongside us, or allowing us to read material from the past or bequeath our own to the future. In many ways, print’s very ubiquity has blinded us to its contours, to the way it shapes the material to which it gives shape. But now, in what’s sometimes called the late age of print, when electronic communication offers an alternative medium for reading and writing, we are beginning to see print and its legacy anew. Print is a technology of copying. After some experimentation, its technical basis was more or less stable from 1500 until the introduction of steam in early nineteenth century. As with all technological shifts, older methods persisted alongside new ways of printing, but steam provided a new motive force that vastly increased the rate of reproduction. It was steam, along with innovations in paper-making, that created the conditions for a mass readership, where large groups of people were reading the same things at the same times. Even so, the everydayness of books was a fairly late development. The printed book has long been venerated, but it was not until the late nineteenth and early twentieth centuries that it became a common object found in most households. We have had books for a long time, but for much of this people’s encounter with print would have been in other forms: newspapers and chapbooks; posters and broadsides. Print is a medium, a way of making text reproducible. As such, it intervenes between the hand that writes and the eye that reads. While we might usefully think of handwriting as a type of technology, too, print makes texts mechanical, the work of a machine. It is curious that few people even notice the shapes of letters or the format of printed texts, instead experiencing reading as a kind of contact with the mind of the author. On the one hand, print masks human agency, making all texts seem like species of the same; on the other, print, a collaboration between a human and a machine, sets text free. As a technology of reproduction, it is easy to see printing as secondary. Authors do the important creative stuff; printers just turn it into reproducible form. But this is to underestimate the power of copying. For almost half a millennium, print has allowed people to get to know those they have never met; it has served as the basis of a public sphere; and it has archived the world’s knowledge. Now, as we come to terms with a new technology of copying, we are beginning to learn the extent to which we have depended on print, the ways in which this technology has set the conditions for textuality itself. The telling of secrets punctuates time. The revelation of whatever has been concealed creates a before and after, in which things are never quite the same. New information, should it be accepted as true, rewrites the ‘before’ as fiction and leaves the ‘after’ as truth. But such truths are only provisional and one never knows what other secrets there are to tell. Secrets make the concealed past present. In a kind of gothic move, things that should have been left behind are resurrected, demanding attention. Such returns are the staples of countless literary plots in the period; they also underpin the many scandals that filled the pages of newspapers. Whereas literary plots can exploit the moments leading up to revelation, as tension increases, newspaper scandals break suddenly, creating a moment that calls for something to be done. In my paper I sketch out some of the links between secrecy and temporality in the nineteenth century. In its first sections, it explores the ways in which secrecy depends upon time, focusing particularly on the way that telling secrets reorders past and present. I then go on to look more closely at such revelations in literary and nonliterary narratives. The paper concludes by looking closely at the way that telling secrets creates a moment in which past and present appear provisional. My argument will be that while secrets rewrite the past, they do so at the cost of the present. I wrote a post as part of the Dickens Our Mutual Friend Reading Project underway at Birkbeck. They’re reading Our Mutual Friend in its monthly parts to mark the 150 years since it was published. I’m really interested in these kinds of projects, as I spend a lot of time arguing that seriality matters. It is very hard to describe things like the significance of waiting or repetition that underpin the experience of serial reading. The difference is experiential and it’s only really by joining projects like this that we get a flavour of what this way of encountering texts was like. I’ve tried similar things in class before: on a course at Birmingham called ‘Victoria’s Secrets’ we read The Moonstone in parts; I also taught She in weekly parts on a survey course called ‘Writing and the World’, also at Birmingham. Both novels were serialised in weekly parts, which made them good candidates for this kind of task, but because of the length of the semester we still had to squeeze them in. It would be very difficult to do something similar with a work published in twenty monthly parts like Our Mutual Friend. Below I’ve reproduced my opening paragraph, but you can read the whole post on the project site. As they sustain relationships, objects become enmeshed in the emotional lives of those they bring together. For Marx, commodity fetsishism meant that objects mediated social relations, taking on a fantastical form that then became naturalised. According to Thomas Richards, this is the reason that descriptions of commodity culture tend to produce accounts ‘of a fantastic realm in which things think, act, speak, rise, fall, fly, evolve.’1 All objects, in this view, can become social actors, but it is those that directly address us, that have been inscribed in some way and are perceived to pass on some sort of message, that interest me here. Mediating objects, according to Derrida, create the sender and receiver, the you and the me, as they move between people. The telepathic connections they activate promise a touch across time and space. Touching always involves touching back: as these media interpellate, they demand a response of some kind, creating the conditions for reciprocity. These things move because they are moving things. In the first issue of Household Words, Dickens and his subeditor William Henry Wills provide an account of a visit to the General Post-Office at St Martin’s-le-Grand. ‘Valentine’s Day at the Post Office is supposed to be one of Household Word’s romances of the everyday, where the souls of the ‘mightier inventions of the age’ are revealed to the reader.2 The General Post-Office is the ‘mighty heart of the postal system of this country’ (12), distributing letters around London, the rest of the country, and across the empire. While the article celebrates the achievements of the postal service, with a heavy dose of human interest, it returns obsessively to the issue of theft. The Post-Office, it transpires, blames the public for using the post to send money, especially coins. ‘The temptation’, they write, ‘it throws in the way of sorters, carriers, and other humble employés is greater than they ought to be subjected to’ (10). At the end of the article, Dickens and Wills return to this theme, noting the dimmed glass window installed, panopticon-like, through which the sorters might be watched. They remark that it ‘is a deplorable thing that such a place of observation should be necessary; but it is hardly less deplorable […] that the public, now possessed of such conveniences for remitting money […] should lightly throw temptation in the way of these clerks, by enclosing actual coin’ (12). By 1850 the post office was understood as a closed communications system: the invention of the penny post, the use of envelopes, and the Post Office Scandal of 1844 buttressed the understanding of the postal system as a set of private channels between sender and receiver. The insistence on the senders’ guilt for tempting the clerks, responds to uncertainty about the conditions of this privacy. Coins are particularly troublesome, as they can be felt through the envelopes, rendering them transparent. There is an uneasiness here about the hands through which letters must pass: hands that fondle and caress the bodies of the moving things that convey content from one place to another. These mentions of theft come either side of the description of the Dead-Letter Office. The place where undeliverable letters are sent, the Dead-Letter office fascinates Dickens and Wills as a place where wealth accumulates. For Derrida, destinerrance means that all letters can become dead letters, as all letters can activate any number of multiple connections and so summon up all sorts of people. Yet, as John Durham Peters notes, the letters in the Dead-Letter Office are dead precisely because they have no chance of interception. These are bodies that have been interred (the word repository also means a tomb) and so have stopped moving. The Dead-Letter Office is a necessary corollary to the emergent role of the postal system in the broader information economy, serving as a material supplement to the disembodied content moved from place to place. As Durham Peters argues, the ‘need for it to exist at all is an everlasting monument to the fact that communication cannot escape embodiment and there is no such thing as a pure sign on the model of angels.’3 As Durham Peters puts it, this is not a problem of the rupture of minds, but of bodies. It is a problem of erotics. Detail from front page of Mugby Junction, All the Year Round, 16 (1866), 1. From Dickens Journals Online (DJO) (2012-) http://www.djo.org.uk/. Mugby Junction is set around the related system of the railway, rather than the post, but it too deals with dead letters. The conceit of Mugby Junction is that ‘Young Jackson’, now known as Barbox Brothers, the name of the firm he works for, is in a kind of stasis, depersonalised and unable to find a place in the world. He is haunted by memories from his past: his mother; his schoolmaster; the former head of Barbox Borthers, and most bitterly the betrayal of his lover and his friend; come back and trap him in a perpetual present. Steven Connor claims Dickens’s characters have, and I quote, ‘a particularly intense relationship to the frequentative, to the condition of simply living on.’4 Unable to continue his journey, Barbox Brothers haunts Mugby Junction, a railway station in the Midlands. His haunting eventually takes in the home of the railwayman known as Lamps and his disabled daughter, Phoebe. Each of the seven Lines seen through Phoebe’s window represents a possible departure, but to help him decide which to take, he offers Phoebe (and sometimes Lamps) a tale from each. In the telling the Lines become lines, designed to fill the space and so put off Barbox’s intended departure. The analogy with the serial form of Household Words and All the Year Round is clear. Dickens, as Steven Connor has argued, also set out to haunt the homes of his readers, not least by circulating his words into their households. 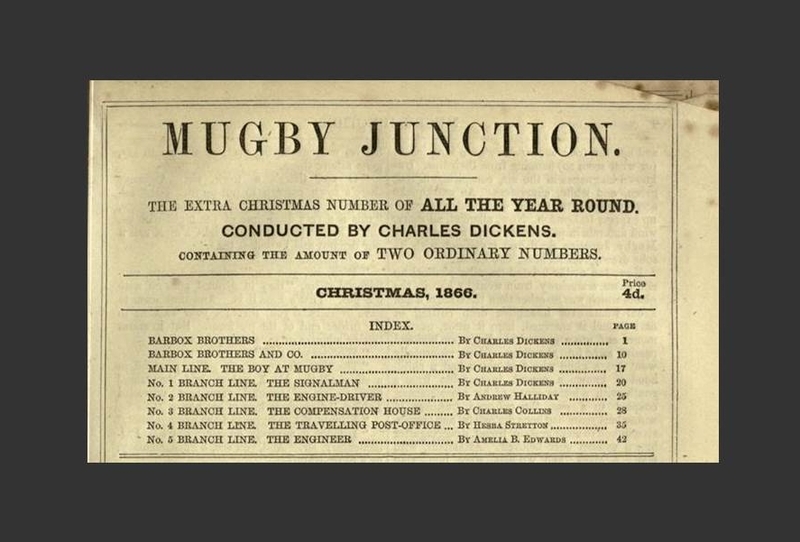 As a Christmas number, Mugby Junction is both part of the weekly series of All the Year Round and also distinct. Its distinctness – it is twice as large (and expensive) and has its own pagination sequence – allows it to better suit Christmas and also serves to situate it in the annual series of Christmas numbers. 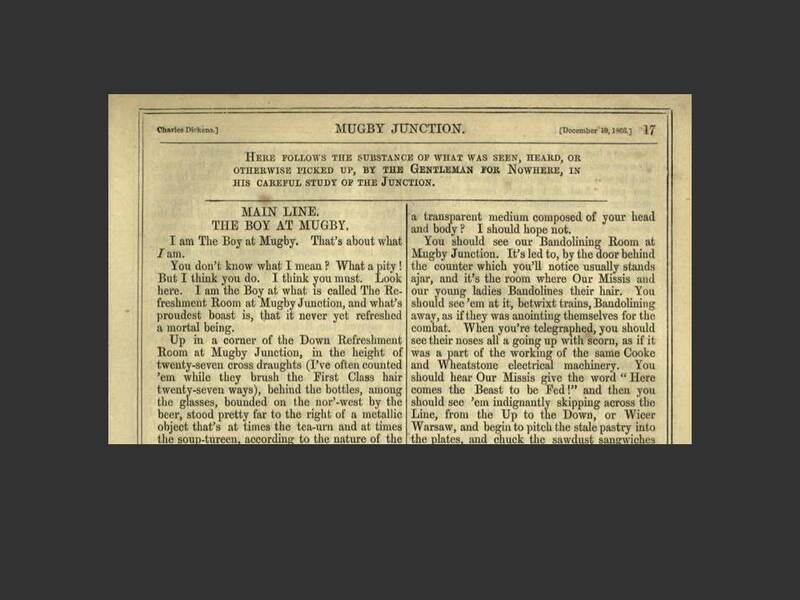 Mugby Junction, then, haunts the fireside at Christmas, filling the holiday period; but it also, as a supplement, haunts the weekly series, reminding readers that there are other rhythms in play – and, of course, that these, too, have their own print forms. What is odd about Mugby Junction is that the narrative of Barbox Brother’s decision is the second in the series, not the last. ‘Barbox Brothers and Co.’ tells of Barbox Brothers’s trip to the ‘great ingenious town,’ Birmingham, where he stumbles across a lost girl called Polly (10). This turns out to be an elaborate sting operation by his ex-lover, who wants Barbox Brother’s forgiveness. Dickens uses the two girls to rejuvenate Barbox Brothers and open him up to the influence of others (this is Dickens after all). After Barbox Brothers forgives his ex-lover and her husband, he becomes Barbox Borthers and Co, taking, and I quote ‘thousands of partners into the solitary firm’ (16). Barbox’s Brothers’s Birmingham experience reconciles him to his past, transforming him from the ‘Gentleman for Nowhere’, as he is known at Mugby Junction, into the ‘Gentleman for Somewhere’. He decides not to move on and instead takes a house in Mugby. No longer haunted, Barbox is no longer compelled to haunt and so makes his haunt his home. Detail from ‘Main Line. The Boy at Mugby.’, Mugby Junction, All the Year Round, 16 (1866), p. 17. From Dickens Journals Online (DJO) (2012-) . This exorcism produces a temporal change that is enacted spatially: Barbox Brothers moves on by staying put. The reader, too, does likewise: now Barbox has made his choice, the rest of the narratives – the ‘Main Line’ and the five ‘Branch Lines’ – are, in effect, dead letters, sitting alongside the two Barbox Brothers tales instead of moving the frame narrative onwards towards its end. In a kind of switch of genre from novel to periodical, from author to editor, the remaining Lines move the reader through the issue, creating striking cross references as they mediate across the issue and beyond. For Barbox Brothers, repetition is stasis, a kind of living death as he haunts Mugby Junction. Recapitulating his origins in narrative gives his life direction and allows him to reach an ending. He settles down and the narrative ends: a quiet death that allows the reader to pass on too. Open-ended serials like newspapers and periodicals also negotiate these two potential ends. As frequentative media, there is always the potential that they become too stuck, like Barbox Brothers, in repetition; but, in constantly chasing novelty, there is also the danger that they will break free from the structure set out in advance and, so, like Barbox Brothers at the conclusion of his story, become something else. Like the Freudian death drive and pleasure principle, eros and thanatos, each of these possible ends has its own motive force. The skillful editor carefully balances these two drives, creating a kind of perpetual present, issue after issue. In narrative, it is only at the end that the beginning and the middle can be conceived as a whole, but then you have to start again with another. Newspapers and periodicals also employ this constant changing of the subject to drive readers on from article to article, issue to issue, volume to volume. However, an editor is not, really, a narrator, and all they can offer is a precarious middle from which the reader can survey the past (represented by the neat sequence of back issues) and the future, tantalizingly out of reach but reassuringly expected to be much the same. This middle, a present teetering between the past and future it produces, is itself intended to pass. As print genres predicated on not finishing, newspapers and periodicals enable repetition while ensuring progression, ordering both past and future by allocating each a period and numbering it accordingly. Moving on by staying put, the next issue displaces the previous, a temporal change enacted spatially. Barbox Brothers might reach his happy end, but the stories keep coming nonetheless. My object of modernity is the absent body of Raymond Lodge, who was killed in the trenches in 1915. Raymond was the son of Sir Oliver Lodge, physicist, spiritualist, and first Principal of the University of Birmingham. In my paper, I consider the way that Oliver Lodge’s best-selling book Raymond testifies not just to his loss, but also to Raymond’s continuing presence. Lodge’s spiritualism was closely allied to his scientific research. Lodge had spent his career working with the ether, the imponderable fluid believed to fill all space and that explained a whole host of electromagnetic phenomena, from wireless telegraphy to the internal structure of the atom. It also provided the material basis for a range of psychical phenomena, including spiritual existence after death. Raymond is presented as a dispassionate account of the evidence for Raymond’s continuing life. However, it is also an exercise in paperwork. Lodge’s attempts to communicate with his dead son should be understood alongside his wider interest in mediation. Lodge was a pioneer of telegraphy and radio and, as many scholars have noted, there was an uncanny continuum between these technological media technologies and spiritualism. Yet Raymond, as a book, represents a further remediation, as the printed object testifies to the reality of the various connections Lodge made with his son. Despite its apparent impersonality, Raymond is concerned with one specific body, Raymond’s, the title of the book asserting his asserting his ongoing presence. My paper considers the place of the book, that old print form, amongst the strikingly modern technologies of the early twentieth century. It considers the way that printed paper offers Raymond a kind of body, while worrying over where (not what) this new body might be.